Steven Nyman (Sundance) nailed the podium in the first test event for the 2018 PyeongChang Olympics, taking third at the Audi FIS Ski World Cup downhill in Jeongseon, South Korea. On a beautiful, sunny day in South Korea, the men got a chance to race the manicured PyeongChang downhill course. While there wasn’t much natural snow, the manmade surface held up for the 54 racers. Nyman stomped a fast run on the short track that heralded his gliding specialty, but Attacking Viking Kjetil Jansrud of Norway snuck ahead of him to take first, with Dominik Paris of Italy on Jansrud’s heels in second. "The snow was very responsive. 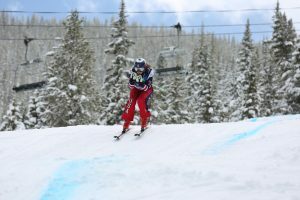 It’s very similar to Beaver Creek and Lake Louise — dry, grippy," said Nyman after his podium finish. "It’s a joy to ski." Rounding out the Americans in the points, new father Andrew Weibrecht (Lake Placid, New York) finished 16th, with Marco Sullivan (Squaw Valley, California) 18th and Travis Ganong (Squaw Valley) 22nd. Ganong, a pre-race favorite, landed hard off of the second jump and his left knee, which has a bone bruise, did not react well. Just out of the top 30, Bryce Bennett (Squaw Valley) was 32nd, Jared Goldberg (Holladay, Utah) 34th and Wiley Maple (Aspen, Colorado) 42nd. Tommy Biesemeyer (Keene, New York) fell but got up and finished the Olympic downhill course to take 52nd.